I though participants will not be able to come, because on that day news of Babri Masjid demolition came and ‘Bharat Bandh’ was announced. Nevertheless, I could go ahead with the program with all participants coming for two full days - 8 and 9 December 1992. Great historical day; not only for IT industry but for India too! Seminar organized on 'Telecommunication in Information Technology". Highlight: First time ever Modem was demonstrated and chat was shown online - way back in 92. At Hotel Blue Diamond: Padmshree Ms. LF Poonawala inaugurated the seminar. Dr. Bishnu Pradhan, Executive Director of C DOT, gave keynote address. Note: These two days Bharat Bandh was observed due to demolition of Babri Masjid. In spite of all odds, I could organized a successful seminar! First time ever Modem was demonstrated and chat was shown online - way back in 92. The inauguration was at the hands of Mrs. L.F. Poonawalla, Vice Chairperson and MD of Alfa Laval (I) Ltd. She expressed the importance of data transfer using the Satellite data link used by Alfa Laval to their parent company in Sweden.The keynote address was delivered by Dr. Bishnu Pradhan, Executive Director of C-DOT. He announced that there are already one million telephone lines working in rural India. Mr. T.H. Chowdary, Director CTMS, Bombay discussed on 'Necessities of Restructuring India Telecom'. Mr. George Kurian of Bajaj Auto discussed on dealer network, linking 120 dealers across the country. Everybody appreciated efforts put by Jyotindra Zaveri organizing this two days training program. Seminar was well attended by hundred participants from leading industries from Poona (Pune) and Bombay (Mumbai). I remember this historical day. I specially had to explain the manager of Hotel Blue Diamond, Pune, India, (now Taj group), to provide with me with a direct telephone line, so that I can demonstrate Internet. Yes, in those days convergence of computer and communication was not known much. All over India, there were riots, due to Babri Masjid issue, and most of the establishments were closed. I was worried, ~ 100 participants had registered, guests’ form various places came to Pune. 'What to do?' But we went ahead with the two days training program, successfully. 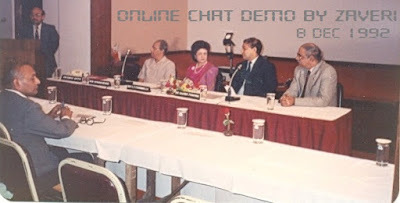 First time ever, online chat was demonstrated to kick-start the beginning of the new era of the Internet. Ms. Lila Poonawala in the afternoon, from her office obliged and came online to do internet chat with us. Venue: Hotel Blue Diamond (now Taj Vivanta), Pune, India.This post is published by Jyotindra Zaveri, IT Professional since ...... 1975.